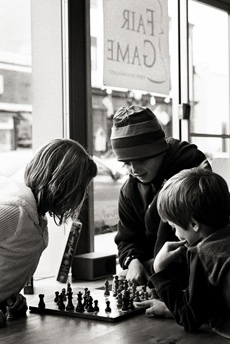 Fair Game is a family-friendly, community-focused board and card game retailer located in the heart of Downers Grove, IL. We take pride in our friendly and knowledgeable staff and their ability to help you select the perfect game for your needs. We have a large selection of activities and games that you can play in the store. We also enjoy hosting organized play, private parties and other special events. With products geared toward all ages, Fair Game offers something for everyone. We invite you to join us and celebrate the hobby that brings family, friends and neighbors closer together.